Action and adventure hit new heights in Far Cry 4, a game that sticks to the open world shooter mechanics developed from previous additions in the franchise pretty closely. While new mechanics are few and far between in Far Cry 4 it’s a solid experience set in one of the more unique settings of the series. Set in Kyrat players assume the role of Ajay Ghale who returns home from America to spread his mother’s ashes. Upon returning though you find yourself in the centre of the civil war taking place between the Royal Army and the rebel movement known as Golden Path. The back and forth engagements that you’ll have with the leader of the Royal Army are particularly well written which does help give some context to your endless Far Cry style rampage. 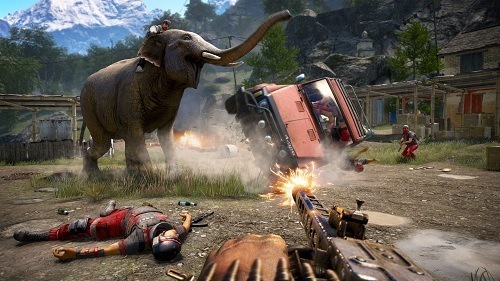 Gameplay has little variation from Far Cry 3 in the grand scheme of things, you’ll still be roaming the countryside accepting side missions while slowly moving through the main plot line. Side missions this time around will have you assassinating key targets, taking over key map locations or helping the citizens in various ways. Just like the previous Far Cry games the best moments of the game will happen while you’re exploring the game world by car, foot and even wingsuit. This exploration will ensure you get a host of random events to earn karma, find a pack of animals to hunt or encounter traders offering to sell some powerful signature weapons. 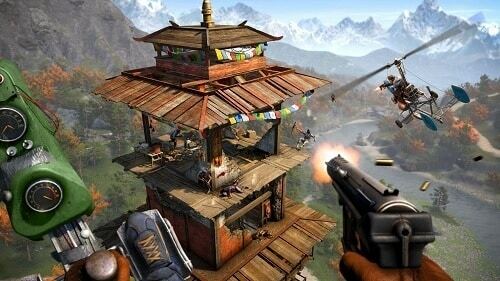 Along your adventure there is plenty to unlock in Far Cry 4 in terms of both skills and weapons providing you can complete the requirements. These vary from achieving a certain karma level, completing certain quests or simply ringing bells and add that extra layer to the game that encourages you to experience everything that is on offer. At the end of the day Far Cry 4 is essentially Far Cry 3 in a new setting with some small quality of life changes. This isn’t necessarily a bad thing since Far Cry 3 was so enjoyable just don’t expect a host of new mechanics. Explore hilly mountain terrain in Kyrat. Countless side objectives in addition to an interesting main plot line. Improve your skills based on your playstyle. Over the top destruction that Far Cry is known for. Hours upon hours of gameplay.